I propose you the visit of my town Djanet, universal inheritance of humanity, it will be the arrival and departure point of your excursions. 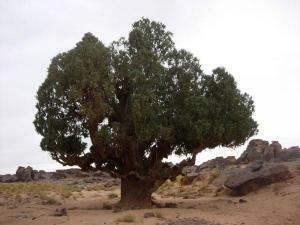 Djanet is located in the extreme south-east of Algeria, it has immense tourism potential: Tassili N’Ajjer National park, carvings, frescoes and paintings from the Neolithic cave, archeological sites, old ksars, oases, palms , gueltas, springs, caves and sand dunes. Don't leave without seeing its palm garden, its old ruins, an architecture testifying the authenticty touareg culture, an irreproachable hability. 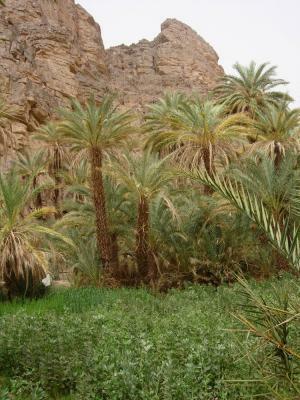 Fortified buildings like Ksar or Aghem have been built in Dajnet, apone the palm garden, counting about one hundred houses. These are composed with a yard, surrounded by one to five bedrooms with small openings allowing a good ventilation and adequat lightning. 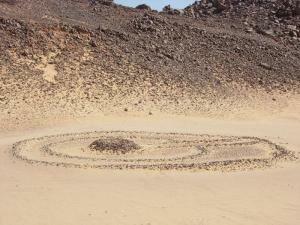 Djanet is known for originality and the quality of its handycraft production, bounded to the nature an history of Tassili. Work with silver, copper, bronze, leather, but also weaving of wool. The blacksmiths, Inadens, take care in the touareg society about silver work to make jewels, iron to product agricultural tools, and wood, for tent pevs and kitchen ustensil. Touareg jewels are appreciated for mysteries and simplicity. Generaly in silver, those jewels offer big variety of patters: the most famous, Teneghelt (Agadez cross), Tiraout (silver or copper amulet), Khoumaïssa (pendentive with five shell work lozenges), Tizabaten (earings), Akafa (bracelet), Tissaq (ring).